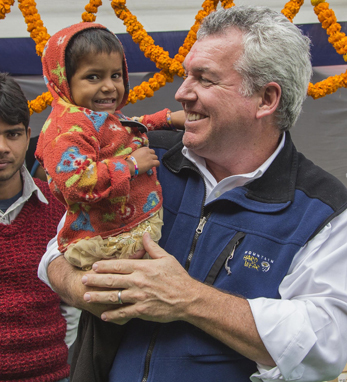 In 1999, Brian Mullaney created Smile Train, the world’s largest cleft charity, which has raised over one billion dollars and provided 1.5 million surgeries. Instead of sending volunteer doctors on missions, Smile Train empowers local doctors in developing countries. In 2010, Brian created WonderWork to tackle the problems of burns, clubfoot, and blindness. To date, WonderWork has helped provide over 275,000 surgeries. Brian produced Smile Pinki, an Oscar-winning movie about clefts that has been seen by 30 million people, and FirstSight, a video about blindness, which has been seen by 16 million in 91 countries. Brian’s work has been featured in CNN, Time, the New York Times, the Daily News, and two best-sellers: Think Like A Freak and A Path Appears. He has spoken at MIT, Princeton, Columbia, Syracuse, Harvard, Columbia Preparatory and Grammar, The Winsor School, Belmont Hill, Hopkins School, Friends Academy, and Fessenden. A third-generation Irish American, Brian’s ancestors come from Boyle, County Roscommon. “Of the many talents that come with being Irish, stubborn determination is my favorite,” he says. “There’s nothing I like better than when someone tells me something can’t be done.” Brian and his wife Cricket have three children, Maura, Charlie, and Quinn, and live in Boston.